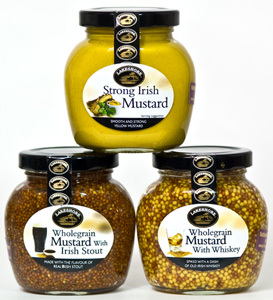 Traditionally a blend of wholegrain mustard with stout ale and/or Irish Whiskey, we offer a fine collection of fine Irish mustards. It reminds the Curator of his stay in Ireland when he was pickpocketed by a gang of ten-year-olds in Dublin. The year was 1978, and he did not then appreciate the glories of Irish mustard. Now he brings you this selection fine mustards from the Emerald Isle. As they say in Kinsale: "Erin, go crazy!"